Building is booming in LA and that drives up the cost of materials. What happens when you add steel tariffs? 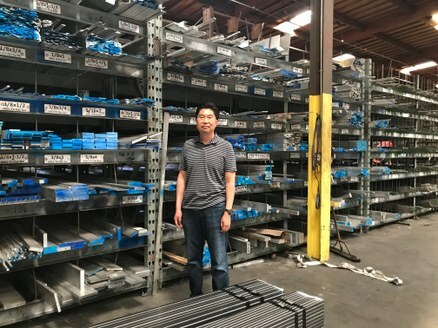 Ron Kong, owner of M&K Metal in Gardena. Photo by Frances Anderton. After all, steel and other metals are everywhere -- hidden from the eye in steel framing and steel studs in drywall; and very visibly in the wavy, decorative, perforated metal claddings that can been seen on facades across the Southland, from the Petersen Automotive Museum to the Corten facades of voguish single family homes. DnA delves into the real world impact of the tariffs -- intended to make US steel more competitive -- and learns that when overseas suppliers put their prices up, so do the domestic suppliers. Metal fabrication at M&K Metals in Gardena. Photo by Frances Anderton. 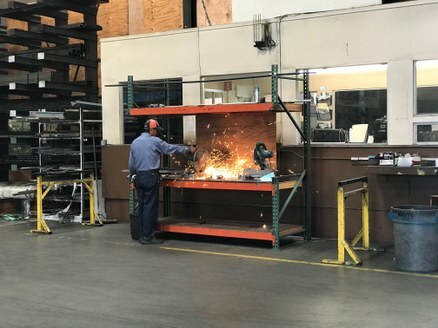 There is so much instability right now that big builders can add “escalation clauses” into their contracts to account for unpredictable price hikes down the line, explains Ron Kong, director of M&K Metals in Gardena. The smaller contractor has less of a buffer. Price hikes notwithstanding, metals are in high demand, as DnA found out when it toured M&K Metals. Then there are the high-rise towers under construction in downtown LA, the Rams stadium in Inglewood and many boutique projects by artists, architects, landscape designers and also “mothers who wish to have an art project in their house for their daughters,” based on “something on Etsy.” After pursuing law and an MBA, Kong joined his father in the metals business. It’s one he loves; he likens himself to a “farmer,” as in “the guy that a master chef would go to” to get the ingredients, in this case metals, to blend into a beautiful new dish. Lakewood, a "Paradise of the Ordinary"